A serial killer kidnapped people and made them take 1 of 2 pills: one was harmless, and the other was poisonous. Whichever pill a victim took, the serial killer took the other one. The victim took their pill with water and died. The killer survived. How did the killer always get the harmless pill? Both of the pills were harmless. The poison was in the glass of water the victim drank. 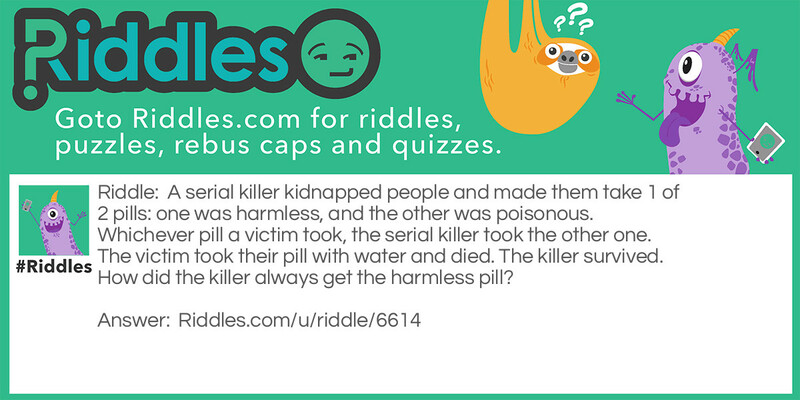 2 pills Riddle Meme with riddle and answer page link.